Our guide on how to find Hyena keys in The Division 2. You'll encounter Hyena crates early on in The Division 2; one of the first we found was during the side mission when you are sent to save Vikram Malik in the Odea Tech Offices. There's a Hyena crate in the room right after you save him but you'll need a Hyena Key to open it. Unfortunately, you can't revisit the area to open the Hyena crate once you've completed the mission, so one of the first things you should think about is hunting down the Hyena Key locations in The Division 2. We've managed to uncover the various faction keys in The Division 2 and we're pretty certain that we've found most of the locations of the Hyena Keys. The first thing you should do is head into the tunnels beneath the grounds of the White House. It's pretty simple to seek out the underground entrances, as they're marked with orange arrows on the map and you'll spot them if you zoom in. Once there, search the tunnels for easy-to-miss cabinets along the walls—you can see the cabinets you're looking for in the image above. These are where the Hyena Keys are located in The Division 2 and you may even find Outcast Keys and True Sons Keys if you're lucky. It's well worth having a bunch of Hyena Keys on hand so you won't be caught out when you find more Hyena crates later on. The first Hyena Key that you can find is just south of the White House, so it's worth taking a quick trip there first. It's also worth checking inside buildings for Hyena Keys, as well as any underground entrances you come across. 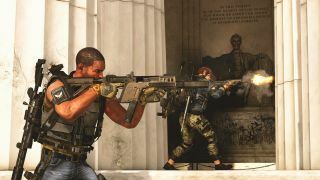 Hyena Keys, Outcast Keys, and True Sons Keys are used to open crates that contain some of the finest loot in The Division 2, so it's not wasted time to pick a bunch up.